Ontario’s career college sector has played an essential role in post-secondary education and career training for over 145 years. After considerable growth, career colleges now train approximately 43,000 Ontarians every year. Many career college graduates go on to accomplish great things in their careers and their communities. It’s time to recognize those graduates and the hard-working instructors who helped get them to where they are today. This year we will once again present the Paul Kitchin Award for Outstanding Community Involvement, which is awarded to a CCO member college that has exhibited, through community involvement, exceptional service in the enhancement of the prosperity of Ontarians. The awards ceremony will also recognized career college graduates and instructors who have excelled in their fields and have made exceptional contributions to their communities. Award recipients will be honoured during the conference dinner gala. Paul Kitchin served as the Executive Director of Career Colleges Ontario from 1988 to 2017. During that period, he skillfully represented career colleges and their students in numerous provincial, federal and international committees and initiatives with a special focus on promoting institutional quality, ethical business practices, student outcomes, inclusivity and outreach. In honour of his outstanding contributions to CCO, to the students of career colleges, and to the broader goals of job training and retraining in Ontario, the members of CCO have established The Paul Kitchin Award for Outstanding Community Involvement to be awarded annually to a CCO member college that has exhibited, through community involvement, exceptional service in the enhancement of the prosperity of Ontarians. 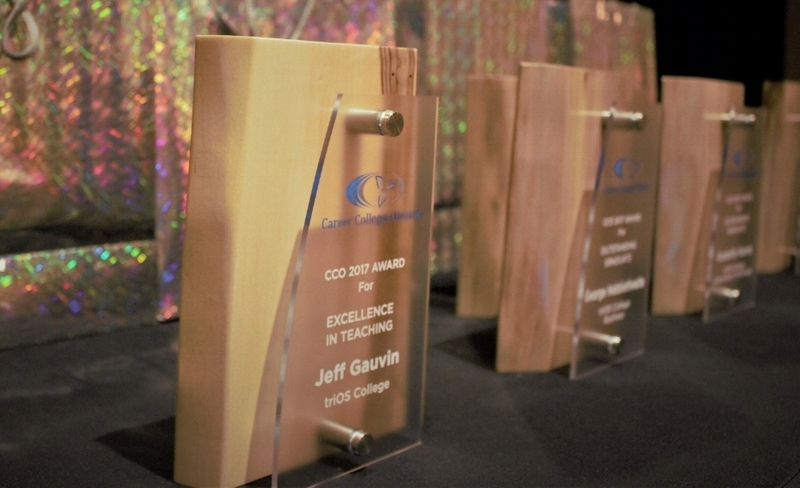 Nominees in the Excellence in Teaching category have put forth extraordinary efforts in their particular field of teaching while at a registered career college that is a CCO member in good standing. The nominees have strived to continually build positive relationships with their students and positively contribute to their community. Nominees in the Outstanding Graduate categories have clearly demonstrated their academic excellence while enrolled at a registered career college that is a CCO member in good standing. They have achieved outstanding accomplishments while employed in their career field and have made invaluable contributions to their community. The award categories reflect the Ministry of Training, Colleges and Universities' registration of vocational programs. Nominees for the Excellence in Teaching Award must be employed by a CCO member career college that is in good standing and registered with the Ministry of Training, Colleges and Universities. Nominees for the Outstanding Graduate categories must have studied and graduated from a CCO member career college that is in good standing and registered with the Ministry of Training, Colleges and Universities. Graduates must have completed their program at a career college within the past 5 years. Individuals that are nominated for NACC’s Instructor or Graduate of the Year Award are eligible to submit a nomination to CCO’s Outstanding Graduate Award. Please note that there is NO COST to nominate.